At Sign World, we offer our clients a wide range of quality signage solutions to help build better businesses and promote your passion projects. Established in 1913, our company has been around for over a century, and in that time, we’ve seen a number of signage styles flit in and out of flavor. 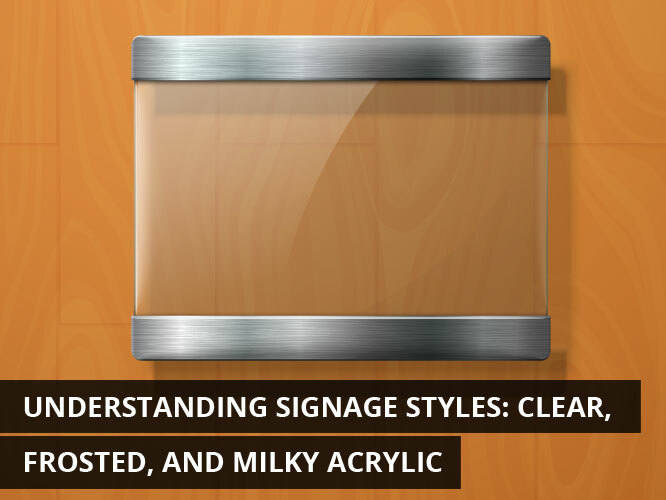 When we’re conducting our conceptualization consults, we sometimes get questions from clients about the difference between clear, frosted, and milky acrylic signs. Which is the better option? What would work better for my business? Today, the Sign World team will break down the difference between these three popular choices to help you make an informed decision for your business. Read on to learn the basics of clear, frosted, and milky acrylic. Clear acrylics are typically made from a form of thermoplastic chosen for its durable, lightweight properties. This thermoplastic material acts as a glass substitute, allowing for comparable transparency. Most manufacturers will print the design directly onto the acrylic, which adds a resilient finish to improve its lifespan. Though the appearance is similar, glass is a less desirable option for this kind of signage because it cannot bend, and it scratches much easier. When choosing how to print your design on clear acrylic signage, you have two options: front or back. We typically recommend printing on the back, for a number of reasons. Printing on the back, known otherwise as “second surface printing,” gives your sign a glossy sheen that many clients find very appealing. And because you view the design through the acrylic, it creates the appearance of greater depth. Second surface printing will also increase the longevity of your sign by putting a protective wall of acrylic between the design and the elements. Frosted acrylic has the same durability, flexibility, and visual appeal as its clear acrylic counterpart, but it has a distinct look. Unlike clear acrylic, this version is not completely see-through. Many clients describe it as a “blurred” translucency; looking through this effect will be like trying to peer through fogged glass. Why choose frosted? Frosted acrylic can also be very aesthetically pleasing, but there more practical reasons to go this route. Frosted acrylic is a great option for diffusing light, since it gives the sign an added dimension, and it always adds an extra level of privacy. If you need to keep curious eyes out of conference rooms, reception areas, or cubicles, frosted acrylic is an excellent choice. The third and final acrylic signage option is referred to as “milky.” As the name suggests, this option is milky-white in appearance, with a mild degree of white translucency. Unlike the previous options, any designs or images printed on milky acrylic won’t be transparent, though some light will be allowed to pass through. Milky acrylic has similar applications as frosted acrylic. You can enhance its appearance and visual prominence by installing it near a light source. Milky acrylic will soften any light that passes through it, which also makes it a great choice to be used covering light fixtures, or serving as the surface of a countertop. Milky acrylic also has privacy-enhancing effects that are greater than its frosted counterpart. Some people will use milky acrylic to create bathroom barriers, room partitions, or private window frames. We hope this comparison has helped you inform your sign-design process. Please direct any other questions about any other sign mediums to our team at https://signworld.org.